The Krups 12 Cup Designer Coffeemaker garners attention first with its upward facing control panel. The panel sits on the top and front of the machine and offers the user large, soft touch buttons and a high contrast black on white LCD screen. The commands are easy to see and program. The machine provides 1100 watts of power inside attractive brushed stainless steel housing. The item comes with a one year limited warranty. The features are where this machine really stands apart from others. Dual auto-on presets allow you to set the machine for separate days and times, such as weekday and weekend brewing or morning and evening cycles, so you won't have to wait or fuss with settings to get your regular pot started. The aroma selection option will create an extended brew for better flavor. The warming plate has a one, two, or three hour auto off function to keep your coffee warm and help prevent heating a pot until dry. An automatic shut off safety feature is also included. The glass carafe is well designed; it has markings near the handle for easier measuring and a lip which prevents drips. With an oversized shower head to thoroughly wet your grounds, the added convenience of an auto lift brew basket, and a duo filter water filtration system, the Krups aims to provide better coffee flavor and to extend the life of your machine. 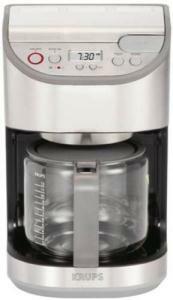 Compare this with the Cuisinart Brew Central coffeemaker.